ACTIVIST ALERT | Dorothy Day Catholic Worker Washington, D.C.
“Let all the souls here rest in peace, for we shall not repeat the evil”. 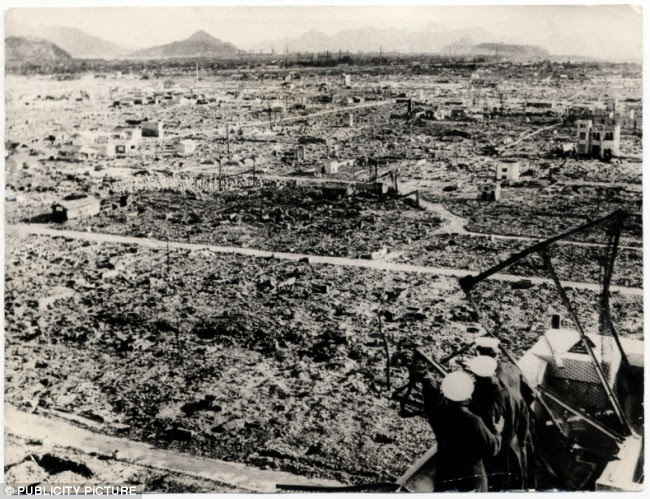 Sixty nine years ago the American government did the “unspeakable” and dropped atom bombs on the people of Hiroshima and Nagasaki Japan. Please join in two nonviolent actions as we seek to remember the pain, repent the sin and reclaim the future. Wednesday, August 6 (Anniversary of the U.S. nuclear bombing of Hiroshima and the feast of the Transfiguration): Nonviolent witness at the Pentagon. Meet on corner of Army-Navy Drive and Fern St. @ 11:45 a.m. Witness from Noon – 1:00 p.m.
Saturday, August 9 (Anniversary of the U.S. nuclear bombing of Nagasaki): Meet at 16th and H St. NW at 11:45 a.m. and process to White House for a Noon – 1:00 p.m. witness. Eleven supporters of the Transform Now Plowshares (TNP) braved chilling temperatures (under 10 degrees) during a Pentagon vigil earlier this morning from 7:00-9:00 a.m. to be in prayerful solidarity with Mike Walli, Sr. Megan Rice and Greg Boertje-Obed of the TNP who are being sentenced today in Knoxville, Tennessee. During the vigil, which was organized by the Dorothy Day Catholic Worker (DDCW), signs were held thanking the TNP for their action and calling for a world without nuclear weapons and war, where all swords are hammered into plowshares and where we practice love for enemies. Also a sign previously made by Mike Walli, a member of the DDCW, stating that nuclear weapons are immoral, illegal and unpatriotic, was prominently displayed. The vigil also included a reading of the TNP action statement several times, the TNP war crimes indictment of the Y-12 nuclear weapons complex and U.S. government, a reflection by me (see below), and an of offering scripture readings, songs and a closing prayer. Ultimately, we were able to witness to hundreds of military and civilian workers as well as many others walking to the bus or metro and inform them about the TNP action and sentencing. We give thanks for the prophetic witness of Mike, Sr. Megan and Greg who by their actions at Y-12, in court and in jail, remind us all of our responsibility to nonviolently resist government nuclear war preparations and to work for the abolition of all nuclear weapons. Pete Seeger–legendary folk singer who died yesterday at age 94—Presente! Thank you for the song of your life! We thank God for the miracle of this day, for the miracle of life and for the precious gift of community. Mindful of the long tradition of faith and nonviolent resistance that we are part of, we call into our presence today the cloud of witnesses who have gone before us and who are now advocating for us. We thank God for their spirit present among us. We also pray in repentance for the nuclear sin and remember all victims–past and present–of the Nuclear Age and of our warmaking empire. Mike Walli (member of the DDCW), Sr. Megan Rice and Greg Boertje-Obed have been jailed since their jury trial conviction last May and face a maximum 30 year prison sentence for their Transform Now Plowshares action at the Y-12 nuclear weapons complex in Oak Ridge, Tennessee on July 28, 2012. They are being sentenced this morning in Knoxville, Tennessee. Numerous people have written to trial Judge Amul Thapar appealing for leniency in stark contrast to the U.S. District Attorney who, in filing its response to defense motions for downward departures in the sentencing guidelines, requested Judge Thapar to sentence the three within the sentencing guidelines, ignoring the nonviolence nature of their action, disposing of them, instead, as though they were armed terrorist saboteurs. Let’s be clear: Sister Megan, Greg, and Michael have committed no crime. Rather they acted to prevent a crime. They should be commended for their action not condemned. “I have known these three people for many years. All three have committed their exemplary lives to following the nonviolent example of Jesus, Gandhi, Martin Luther King, Jr. and Dorothy Day. They have done extraordinary work helping the poor in the respective communities where they live. They are people of honesty, humility and integrity who have selflessly worked for the common good. The action they took at the Y-12 nuclear weapons complex should be viewed in this light. Their action was not to call attention to themselves but rather to expose an imminent threat which endangers human survival and to demonstrate the urgent need to eradicate this colossal threat. 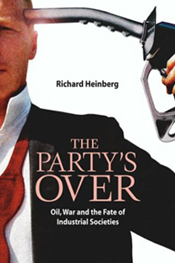 In Command and Control: Nuclear Weapons, The Damascus Accident, and the Illusion of Safety by Eric Schlosser, (selected as one of the New York Times “most notable books “of 2013), Schlosser asserts that nuclear weapons “are a collective death wish, barley suppressed. Every one of them is an accident waiting to happen, a potential act of mass murder. They are out there, waiting, soulless and mechanical, sustained by our denial—and they work.” Comprehending the magnitude of this perilous nuclear reality, Sr. Megan, Gregory and Michael engaged in a conscientious action to say Yes to the God of life and love and No to this collective death wish which nuclear weapons undeniably represent. While the three have been found guilty of several serious crimes, their intention was not to commit a crime but rather to uphold God’s law and those international laws and treaties which prohibit the use and threatened use of weapons of mass murder. It is tragic and alarming that the government has characterized the actions and crimes for which the three have been convicted as “violent” and “terrorism.” Nothing could be further from the truth! It is a matter of public record that there was no evidence of intent on the part of Sr. Megan, Gregory and Michael to harm anyone. I share the strong concern that you, Judge Thapar, raised during the trial that Congress would pass a law which does not allow you to distinguish between acts carried out by peace activists and those carried out by terrorists. These three people are courageous peacemakers who, by their prophetic actions, remind all of us of the moral responsibility we each have to beat all the swords of our time into plowshares and to abolish war. So let’s pray today for the Judge Thapar and for the U.S. District Attorney, that they listen to their conscience and be open to the truth, and not be blinded and feel trapped by law’s and sentencing guidelines. And let us pray for the defendants and all who are attending the sentencing today. We ask God’s blessing on our three friends to be sentenced as they continue to witness in court to the same spirit of truth and love that compelled to act at the Y-12 nuclear weapons complex. The Transform Now Plowshares action stands as a timeless testimony to making God’s dream for the human family a reality: a world where people love one another–a world without exploitation, violence, weapons and war. 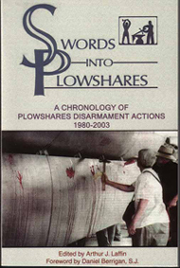 As we witness at the Pentagon, the center of warmaking on our planet, we invite all Pentagon personnel, weapons manufacturer’s, politicians, all who comprise nuclear national security state, and all people everywhere to transform their minds and hearts and heed the prophetic call to beat all the swords of our time into plowshares and to abolish war! This is an invitation to please join with the Dorothy Day Catholic Worker and other peacemakers from Pax Christi Metro D.C.- Baltimore, Peace Action Montgomery and Jonah House in a nonviolent witness to protest the AFA Arms Bazaar (see below). Please come and bring a friend. And please spread the word and post this wherever you can. As the U.S. political and military power structure, backed by the big weapons contractors, threatens military action against Syria, we urgently need to speak out for peace and against any military attack. Together, let us continue to do all we can to establish the Beloved Community and create a world free of weapons, war and oppression. We will meet for the vigil at the corner of Waterfront St. and St. George Blvd., directly across from the Gaylord National Resort. Be a part of the Air Force Association’s 2013 Air & Space Conference and Technology Exposition September 16th through 18th, 2013. The conference once again will be held at the Gaylord National Resort & Convention Center on the Potomac, in National Harbor, just across the river from Alexandria and minutes from downtown Washington, DC. The Air & Space Conference and Technology Exposition is truly a one-of-a-kind event where AFA brings together Air Force leadership, industry experts, academia and current aerospace specialists from around the world to discuss the issues and challenges facing America and the aerospace community today. Invited speakers for 2013 include the Secretary of the Air Force, the USAF Chief of Staff, the Chief Master Sergeant of the Air Force, and other top Air Force, government, and aerospace industry leaders. Our national conference attracts the top echelon of USAF senior leadership, including the commanders of every USAF command. Also invited are military dignitaries from air forces worldwide. The AFA 2013 Air & Space Conference offers attendees major conference addresses, forums and professional development workshops that focus on challenges and accomplishments unique to the Air Force and the aerospace community. The Technology Exposition will feature aerospace exhibitors from around the world that will display and demonstrate the latest breakthroughs in air and space technology. The exhibits at AFA’s Technology Exposition highlight the most current developments in aerospace technology and education. The 2013 Air & Space Conference and Technology Exposition is your opportunity to network with colleagues, Air Force leadership, guest speakers, and professionals and pioneers from the private sector. Be a part of AFA’s premier national forum for aerospace professionals. General Dynamics and Northrop Grumman, two of the region’s largest defense contractors, reported Wednesday an uptick in profits during the past three months despite a decline in government spending. Both of the Falls Church-based companies cautioned that the automatic spending cuts related to the sequester could take a greater toll on their bottom lines in the future, but they were upbeat about their performance so far and raised their profit expectations for the rest of the year. General Dynamics’ profit grew about 1 percent during the second quarter to $640 million, while revenue was flat. Northrop Grumman’s profit increased 1.7 percent during the quarter, reaching $488 million, while revenue grew slightly to $6.3 billion. Their results largely echoed those of Bethesda-based Lockheed Martin, the country’s largest defense contractor, which reported a 10 percent jump in quarterly profits Tuesday and raised its profit expectations for the year. The Air Force and some 150 arms contractors taking part in the AFA Air & Space Conference and Technology Expo, what we call an “Arms Bazaar,” have played a prominent role in U.S. warmaking. These arms contractors, like General Dynamics, Northrop Grumman and Lockheed Martin (mentioned in above article) are profiting from war and literally are making a killing! But that’s not all. The Air Force and numerous arms dealers are committed to U.S. nuclear/military superiority and militarizing and controlling space. The U.S. continues to be the #1 arms dealer in the world. Foreign military sales by the U.S. were expected to reach $60 billion in fiscal 2012 ending September 30, according to Richard Genaille, deputy director of the Pentagon’s Defense Security Cooperation Agency, which brokers such government-to-government deals. Worldwide weapons sales by the United States tripled in 2011, according to a report by the Congressional Research Service. U.S. arms sales to both developed and developing nations reached $66.3 billion in 2011, up from $21.4 billion in 2010. Total worldwide weapon sales in 2011 nearly doubled to $85.3 billion, making the U.S. responsible for more than three-quarters (77.7%) of all global sales. Some of the biggest purchasers of U.S. weapons that year were Middle Eastern nations, including Saudi Arabia, whose 2011 purchase of 84 advanced F-15 fighters in part accounted for a $30 billion bill. And Egypt has been, and continues to be, a large recipient of U.S. military aid and weapons. In the wake of the recent coup and horrific violence carried out by the Egyptian military government, Egypt still stands to receive $1.3 billion in U.S. military aid. However, if the Obama Administration were to acknowledge that a military coup took place in Egypt (which it still refuses to do as of this writing), Egypt could not receive this aid because it would be in violation of the law. From September 16-18, the AFA will host speakers and seminars that will address how the U.S. can refine its warmaking and remain the preeminent military superpower on earth and in space. And on September 18, the AFA will hold a $330 per plate banquet sponsored by Lockheed Martin. 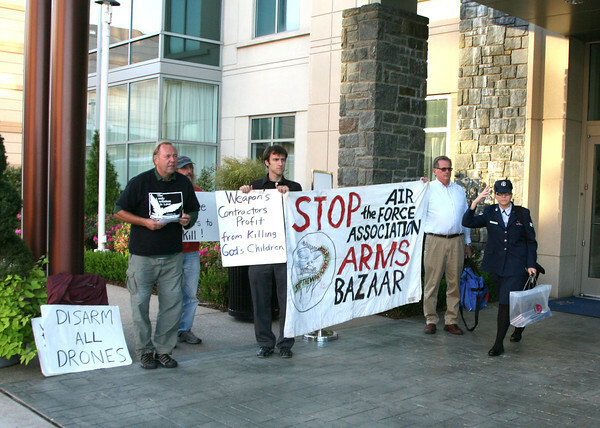 As the AFA holds its opulent banquet, a nonviolent vigil will be held to decry this scandalous Arms Bazaar. Who will give voice to the victims who have suffered and died in Iraq, Afghanistan, Pakistan and elsewhere as a direct result of U.S. warmaking, and weapons, like the Drone ”Predator” and “Reaper” war planes, produced by the arms contractors participating in the “Arms Bazaar”? In the name of God who calls us to love and not to kill, it’s time to end this Arms Bazaar! It’s time to repent of U.S. war crimes and make reparations to all victims of U.S. warmaking. It’s time to bring all the war money home, alleviate poverty, meet urgent human needs, and save our environment. It’s time for the U.S. to stop threatening to attack Syria. It’s time to end construction of a new U.S.-backed naval base on Jeju Island in S. Korea that will serve as a U.S. military outpost to threaten and contain China. It’s time to disarm and eliminate all weapons–from nuclear weapons to killer drones, end all U.S. military intervention, abolish war and practice nonviolence. Please consider coming (and bring a friend) to this important vigil, and say Yes to Life and a resounding No to the war profiteers. We must not let this Arms Bazaar go unaddressed! Take 395 South (off of New York Ave. or Constitution Ave. at 9th St. NW) Merge onto 295 South via exit on left (crossing into Maryland) – 7.4 miles. Take the exit toward National Harbor. Take ramp to National Harbor Blvd. Bear left on National Harbor Blvd. and go two blocks to St. George Blvd. Make a right on St. George Blvd. Go to one block beforeWaterfront St. and look for street meter parking. Also St. George Parking Garage is on right in case you can’t find street parking (just past the cross street called Mariner Passage). The garage is one block before Waterfront St., where the Gaylord National Resort is located. We will meet for the vigil at the corner of Waterfront St. and St. George Blvd. on the sidewalk in front of the Gaylord National Resort. If you are coming from Maryland or Virginia use Map Quest for the most precise route to the Gaylord. Sixteen years in prison is not enough? Sister Megan Rice and her friends, all peace activists, already face 16 years in prison if convicted for a nonviolent peace action. Sister Megan, Greg Boertje-Obed, and Michael Walli went to Oak Ridge, Tennesse, to say NO to nuclear holocaust. Instead of dropping charges, the US Attorney General and the Department of Justice are considering two additional charges against this 82-year-old nun and two U.S. veterans, both sabotage charges. One carries 20 years and the other 30 years in prison. With the new charges, the defendants would face a maximum of 65 years in prison. This is the equivalent of a death sentence. Megan, Greg, and Michael called their action “Transform Now Plowshares,” and brought nothing more dangerous than flashlights, binoculars, bolt cutters, bread, flowers, a Bible, and household hammers to Oak Ridge. They hammered on the walls of a storage facility to symbolize the disarming and abolition of nuclear weapons. The real danger to society is not this nun and two veterans, but instead the facility they want to transform. This unconstitutional facility holds enough weapons grade uranium to make more than 10,000 nuclear weapons, far more than what scientists say is needed to destroy life on earth. 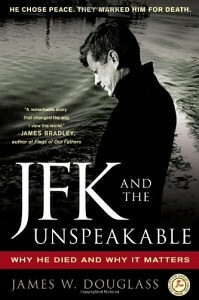 Please join in this petition to the Attorney General of the United States asking him to refuse to authorize additional charges: 16 years in prison for revealing the criminality and insecurity of nuclear weapons production smacks of killing the messenger for the failings of the king. To contribute to this work for nuclear disarmament, click here. Dear friends, Kevin and I will be on on trial next week for protesting the School of the Americas on Capitol Hill with 4 other Human Rights Activists including founder of SOA Watch, Fr Roy Bourgeois. Please share press release below widely. Thanks so much for your prayers, love and your support! At 8:00 a.m. on Tuesday, September 18, 2012, the peace activists will be available to speak with the media. They will then proceed to a trial, which will be held in the DC Superior Court. Washington, Dc – On April 16, 2012, hundreds of activists marched on Capitol Hill to demand the closure of the School of the Americas (SOA/WHINSEC). 13 of these activists were arrested when they attempted to march past the Congressional office buildings, were held for 6 hours by Capitol Hill police, and finally charged with “Blocking Passage.” Five are scheduled to go on trial on Tuesday, September 18, 2012 for engaging in a protest to close the SOA/ WHINSEC on Capitol Hill in Washington, DC. The “SOA 5,” a group of human rights activists from different parts of the country, were on Capitol Hill, among hundreds of other activists, to ask Congress to close the SOA and end the militarization of Latin America. As they tried to lead the march down Independence Avenue in front of the Congressional buildings, they were impeded by dozens of police who blockaded their passage. Despite the threat of arrest by the Capitol Hill police, the brave activists insisted to stand for their right of speech.